We couldn’t do it without you! Ticket sales cover less than a quarter of our annual operating costs; we rely on your generous support to help us bring you the best live baroque music all year round. The Sebastians are a 501(c)3 non-profit, so your donations are 100% tax-deductible! You can give using the secure form above—it only takes 30 seconds!—or make out a check to "Sebastian Chamber Players" and mail it to 163 Saint Nicholas Ave. #2H, New York, NY 10026. Feel free to contact us to discuss larger gifts or in-kind donations. Many companies offer matching gifts that can double the bang for your buck! Contact us for help arranging a matching gift from your company, or to discuss other corporate support. Want to share your love of the Sebastians? 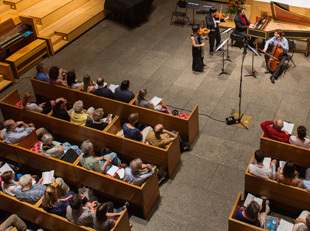 Host a concert at your home, church, country club, or community center, and you’ll be helping the Sebastians continue our mission to bring you the best of the baroque! We welcome any assistance you may be able to provide with travel, printing and merchandise, tax preparation or grant-writing, marketing and advertising, as well as gifts of food/beverages for receptions or luxury items for auction. Contact us to discuss your gift. Click here to shop on Amazon Smile and Amazon will donate 0.5% of the shopping cart to the Sebastians. Every little bit helps...! Who knew you could donate while you shop?! Sign up here.